Half-mortal, half-divine, the Greek divine hero Heracles, better known by the Roman translation, Hercules, is best remembered for his remarkable strength and willingness to carry out seemingly impossible tasks. At the behest of King Eurystheus, the hero is said to have completed the feats which became known as his Labours. 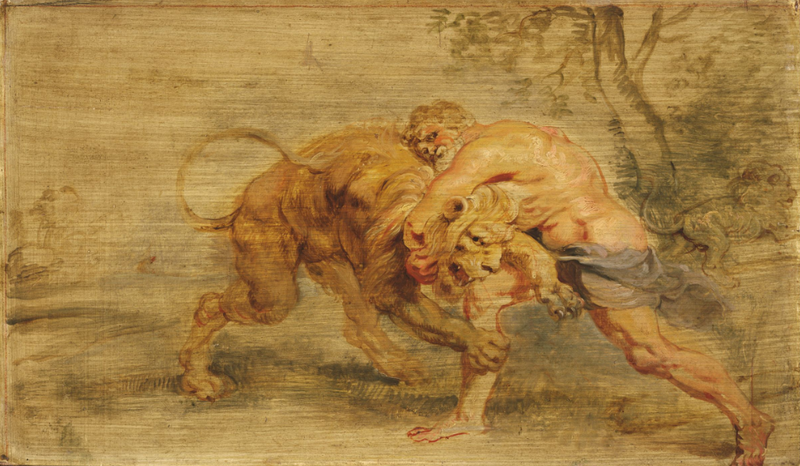 Over the course of twelve years, Hercules slayed a lion, stole some apples and captured a vicious dog, among other extraordinary tasks. Seemingly mortal, nevertheless divine, the Greek guard Giannis Antetokounmpo is becoming known for his remarkable length and ability to carry out heretofore impossible tasks for the Milwaukee Bucks. At the behest of his coach, Jason Kidd, Giannis is undertaking laborious missions of his own, already pushing the boundaries of what a point guard is and can be in today’s NBA. Have you moseyed through the Milwaukee Bucks’ team page recently? It’s perfectly alright not to have. Most people probably aren’t checking it regularly, being that a 13-12 Eastern Conference team doesn’t typically make for exciting downtime perusal. What follows, then, are the highlights; namely, the team’s leaders in major statistical categories. Well, look at that. 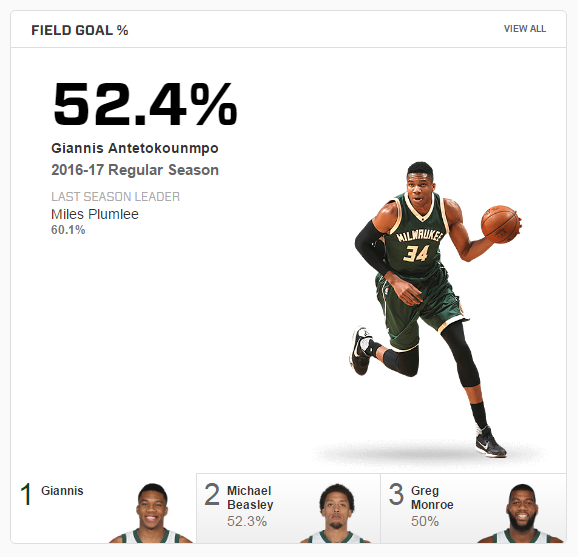 Giannis is the team’s leading scorer and rebounder. That much makes sense, what with Greg Monroe’s limited minutes and the fact that Giannis averages more minutes per game than both John Henson and Miles Plumlee, the team’s other centers, combined. Let’s check in on some other stats. Ah, Giannis again. That fits. He’s been shooting a career high percentage from inside the arc on a personal best number of attempts, and Jabari Parker is getting shots attempts from eight feet or closer at the lowest rate of his career, per NBAminer.com. Also contributing to that is the fact that Parker’s average field goal attempt distance is nearly two feet longer than it’s ever been in his career, having upped his three-point attempts by almost three per game, per basketball-reference.com. But wait, there’s more. I’m starting to think I’m looking at prints of a shoe label running off the press rather than an NBA team’s statistical profile. 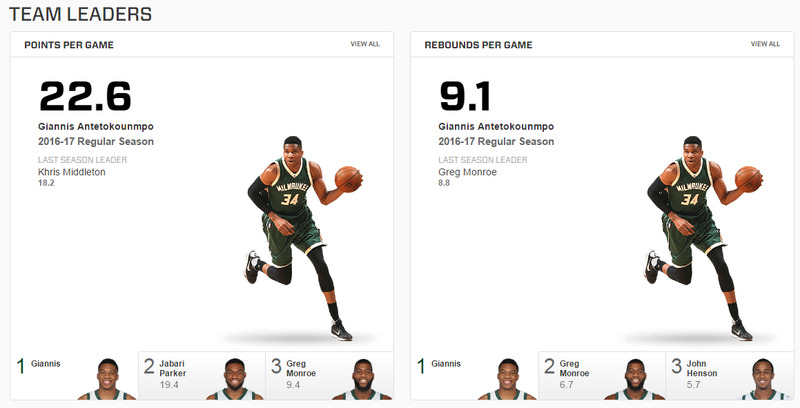 Giannis leads the Bucks in these six categories, including the five major stats: points, rebounds, assists, blocks and steals. The last player to do that over the course of a full season was, as you might expect, LeBron James, during his first stint with the Cleveland Cavaliers, in 2008-’09. In fact, only three other players in NBA history have done it: Dave Cowens, Scottie Pippen and Kevin Garnett. Giannis is in rarefied air with his exploits thus far this season. What makes Giannis especially incredible this season is that he’s doing this having only just turned 22 on December 6. By comparison, Cowens was 29, Pippen was 29, Garnett was 26 and James was 24. Even the most preternaturally gifted among us, the prep-to-pro generation, only gave us two players to do what Giannis was doing, and LeBron was two years older at the time he accomplished it. 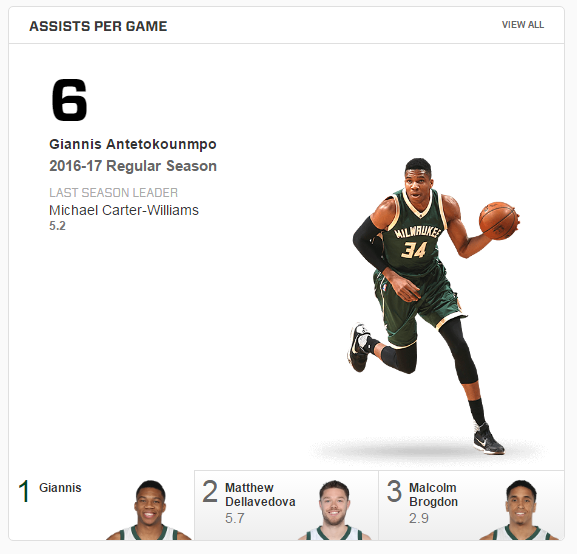 But Giannis isn’t merely dominating the Bucks’ statistical categories. As it stands now, with regard to the entire NBA, the Greek Freak is sixteenth in both points and rebounds, seventeenth in assists, fourth in steals and fifth in blocks per game. As far as NBA players who have averaged over 22 points, 5.9 assists, 2 steals and 1.9 blocks per game over an entire season, Giannis stands alone if he can keep this up. If we pare that down to 20 points, five assists, 1.5 steals and 1.5 blocks, there is only one peer: Michael Jeffrey Jordan. As unbelievably mind-boggling as Russell Westbrook has been this season, collecting triple-doubles the way Zsa Zsa Gabor collected husbands (all due respect), he isn’t changing his position, per se. Westbrook happens to be a relatively averaged-sized, if otherworldly athletic, point guard whose team needs more out of him. He is maximizing the expectations of his position in today’s NBA, pushing the bounds like Derrick Rose, Magic Johnson and, yes, Oscar Robertson before him. The Bucks don’t necessarily need Giannis to be doing what he’s doing. As a team with a promising young core and one of the smartest minds in league history at its helm, Milwaukee can afford time for growing pains. Giannis’ development as a point guard, however, has entirely shifted what the Bucks can hope to be. Whereas Westbrook is a speedometer with the needle stuck in the red, treating every road like it’s the Autobahn, Giannis is an electric flying car. The twelfth and final Labour of Hercules involved his traveling to the Underworld to capture Cerberus, the three-headed watch dog. Upon subduing the animal, Hercules threw him over his shoulder and brought him back to Eurystheus, who released the hero from any further work. In one tradition, Hercules is said to have then joined Jason and the Argonauts on their quest for the Golden Fleece. Giannis Antetokounmpo has labors yet ahead. Watching his unthinkably long limbs get him from the top of the three-point arc to the rim in two steps, like listening to an epic tale about Greek gods, requires some suspension of belief. Unlike Hercules, however, Giannis is very much real, an immortal in his own right, his skill and potential growing in parallel with each game.